A pathogen is a synonym for a disease-causing microorganism. Food pathogens represent a special form of microbial pathogens, which are picked up and spread through food. Below a number of pathogens are listed, for which BIOTECON Diagnostics offers suitable foodproof® DNA extraction and real-time PCR detection kits. Many of the pathogen kits have been certified by recognized institutions such as AOAC-RI, MicroVal or NordVal (see licensing options / validations), and thus independently tested for quality and safety. Clostridium botulinum is an anaerobic, endospore-forming, Gram-positive bacterium, which can cause botulism. Botulinum toxins are the most potent bacterial toxins known and may occur in inadequately preserved foods, such as canned or cured meat. Children are especially vulnerable and can become seriously ill after consuming food contaminated with spores, such as honey or milk powder. 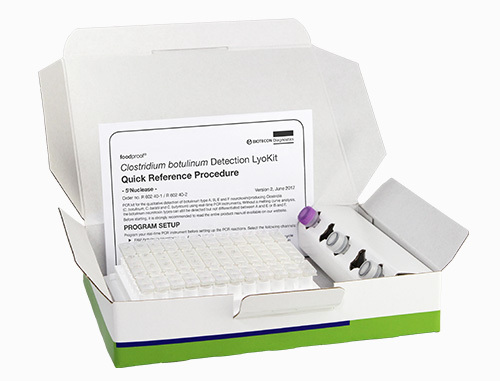 The foodproof Clostridium botulinum Detection LyoKit detects all human-relevant toxingenes – types A, B, E and F – in a single multiplex real-time PCR reaction.